Two posts on Shiloh the Hovawart needing help to get adopted. The attention makes me very happy but this gives us all mixed feelings. The turn-off of course is that Shiloh still has not get adopted. Next to the BSL stories probably one of the most important news items I could bring to you from little Denmark. A puppy mill that exports to the U.S., among others. Thank you for helping spreading the word getting this puppy mill exposed. Are you prepared for a dog fight? Inspired by the real story of my dad getting severely bitten while intervening in a dog fight. What we can do to prevent, and also how to act in a dog fight. Today, my dad has fully recovered from his injuries. One colored, truly biased and overly positive look on the Hovawart breed. 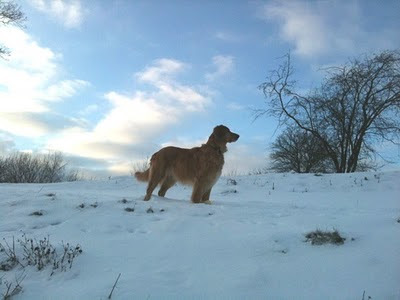 But hey, this would not be a Hovawart blog without a muse on this beautiful breed we have come to love so much? With all the training and socialization we do with Kenzo, he can still awe me with what he can do when acting from within his own natural being. This is what makes me the most proud of him. Loved your choices, my own top 5 would not have been much different. Looking back is great but what lies ahead? You will have to be patient until January 10, when we come with a post as part of the Pet Blogger Challenge, organized by Edie and Amy, from the Will My Dog Hate Me and GoPetFriendly.com blogs respectively. Stay tuned and best wishes for the New Year! We do not usually have a "Wordless Wednesday" - posting pictures without words on wednesday - on our blog. But I couldn't resist after taking this wonderful picture of Viva today. We named it "Viva La Bella". Me adding these comments didn't help either we will ever get wordless on any wednesday whatsoever. 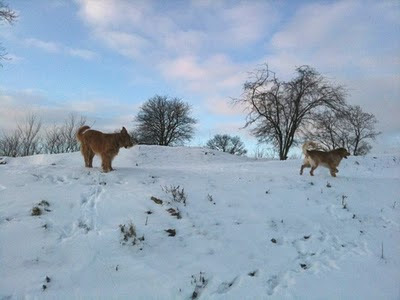 Viva:"Kenzo wait for the photo", Kenzo: "No time, the snow could melt"
A brand new dog show aired on Danish TV recently. It has a refreshing concept building on dogs, kids, adoption, and positive reinforcement. After watching the first couple of shows I am so positive about it as it conveys some great messages on adoption and getting professional help when adopting. I hope production companies in other countries get inspired by the concept. Each show is about a family. The children's greatest wish is to have their very own dog, while the parents do not think their children can take on the responsibility to care for a dog. They say No. Together with Jan Vestergaard - the newbie TV host and a dog trainer/behaviorist in normal life - the children meet with three dogs. Each dog has been preselected from the local shelter by Jan Vestergaard. He helps them to choose one of the dogs, and the kids are allowed to take the dog home with them for a couple of days. Jan Vestergaard visits the family and teaches the kids how to walk with a leash and other basic routines using positive reinforcement. You can almost hear the kids think "that's easy we are home-free!" Of course, during the days the dog stays at the family, issues turn up. Jumping on guests, barking at the door bell, not being house-broken, etc. Unfortunately for the kids the parents discover this also and point it out to be not acceptable. "Bummer! not so easy after all!". Jan Vestergaard shows the family what they can do and works with the kids to chance the behavior, of course with success. He succeeds very well in explaining it as not being something bad about the dog, and turns disappointment into success. Positive reinforcement for the whole family. The show closes with the "moment supreme", asking the parents for permission to keep the dog. You know how that turns out, as we are still watching television. I would say nice things about any TV-show that is not about the usual pack leader blabla. But I especially like this show because it promotes not only adoption, but also getting professional help when adopting. When the show increased in popularity, you could see dog trainers in Denmark doing more to promote their services to help families adopt a dog. And clearly the show has contributed to people's interest in this service. Why is that a good idea? Kevin Myers wrote a very good post on his DogLoversDigest blog: Keeping It Real When Adopting a Dog – Step Two: Find a Trainer. I say no more. The name of the show itself is "Så er der hund", which is impossible to translate to English. What it tries to convey would be something like "And now we have a dog / are a dog family / gone to the dogs". All at once.